Tietzes syndrome casefile reveals a puzzling chest pain condition. You're likely to find that doctor and chiropractor have never heard of it; I hadn't until I'd been in practice for over twenty years. However faced with patients with what we'll call non medical chest pain on a regular basis I became interested, and started looking up the literature; there's very little research on the subject. Many ER consultations for left sided chest pain relate to this nasty condition. It does not respond to anti inflammatories. This blog tells the story of a young woman with three years of unrelenting chest pain. Tietze's syndrome causes a costo sternal lump between the rib and the breastbone. And sometimes a clavicular sternal lump at the collarbone joint, more frequently in women than men. Patricia, a 33 year old woman, has had low thoracic pain that radiated up to the midback and between the ribs to her sternum where she had a constant aching pain. It began immediately during or soon after the birth of her first child. Chest pain is the most common symptom of a Tietze's syndrome casefile, often thought to be a heart or breast condition. Tietzes syndrome casefile tells the story of a young woman with three years of unrelenting breastbone pain. My apologies for the variable use of the apostrophe; is it Tietze's or Tietzes syndrome? The former of course, but search engines don't like it. Her doctor made a diagnosis of Tietze's syndrome, the correct diagnosis in my opinion, but when his pills didn't help, he sent her to a physiotherapist. She didn't know the reason, but PT seemed to aggravate the condition. Hard manipulation in the midback certainly will worsen this condition, and is sometimes the primary cause of chest pain and Tietze's syndrome. Treat any anecdote with a pinch of salt! It's not scientifically admissible, but behind this Tietzes Syndrome CaseFile you may find a gem of truth that could be helpful. On examination a mild double scoliosis was evident with one apex in the upper lumbars, and the other apex in the mid-lower thoracic spine. Right rotation of her midback was painful in the spine. Lateral compression of the chest caused pain in her back, along the ribs on the right, all the way to the breastbone. 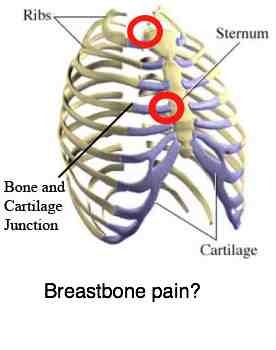 Pressure over the joints between the 6&7th ribs, where they attach to the sternum was extremely sensitive. No oedema was evident. On exhalation those two ribs did not move downwards in the normal manner. All in all a difficult Tietzes Syndrome Case. What particularly irritated her was the fact that she couldn't lift her children onto her bicycle, as all Dutch women do. The rib treatment of this condition is highly specific. Heavy manipulation of the midback will often aggravate, and even cause the pain. So we use specific mobilisation techniques of the joints in a Tietze's syndrome casefile such as this, where they meet with the spine, and at the attachment at the other end to the breastbone. Happily, Patricia said this morning that, after only six treatments over a 5 week period that she is 70 percent better. It was nice to be called her hero and that I may never go on pension. We are now involved with a series of rehab exercises, and have made a start with two other conditions that often are associated with a scoliosis; tingling in her right arm associated with a thoracic outlet syndrome, and a numb feeling down her leg. Frankly, in my experience, Tietze's syndrome casefiles never seem to resolve completely as in many medical conditions; they need ongoing management and care, much of it done by the patients themselves. I'm not sure why that bothers folk as they accept entirely that diabetes, or hypothyroidism or hypertension, for example, likewise need continued treatment. Tietze's syndrome comes in four stages, only the fourth produces an angry red swollen nodule on the breastbone or SC joint. MERALGIA PARETHETICA ... pain and tingling down the side or front of the thigh. At chiropractic help clinics every patient is unique and the treatment needs to be modified to fit the condition; it's what makes our work so interesting and challenging. And no where is this more true than with a Tietze's syndrome casefile like this. The presentation varies from person to person. For example, is this Tietze's syndrome? 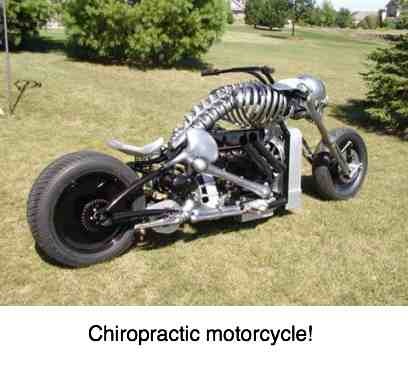 Several orthopaedic surgeons and chiropractors don't know. Could a chiropractic mishap be one of the causes of Tietze's Syndrome? Why, certainly and so could a heavy midback chiropractic manipulation. I've done it myself. Chiropractic Iatrogenic Illness is the name given to doctor caused disease. Another Tietze's case file, explained in somewhat more detail, and associated with extreme heartburn; the long and the short of it is that it's a complex syndrome with many different presentations and causes. It's not uncommon after a mastectomy or breast enlargement; in this case a young man with a chronic midback rib subluxation.